Who are the kids in your series, 3 Feet High and Rising? They are residents of Baltimore City. I may walk up and say something like, “Hey, what’s your name? I love that fit you put together. Is it cool if I take your picture?” It became important for me to affirm them in some way before making the photograph. That seems to always work in terms of build a sense of trust with them. There is an immediate, unmistakable maturity –or play at maturity– to some of these kids. For instance, the girl in the leather jacket's pose, the boys smoking, or the group all together, around the boy on the bike. Are these things you were looking to capture or something you noticed, afterward? I noticed it immediately, just passing them by as I walked down the streets. I admire the confidence and authority that so many of these kids possess. They know who they are. They aren’t afraid of being themselves, whether they’re in front of a lens or not. I think that maturity you are referencing, that deeper sense of confidence and self-awareness is something that speaks to what it means to grow up and live in Baltimore City at that age. 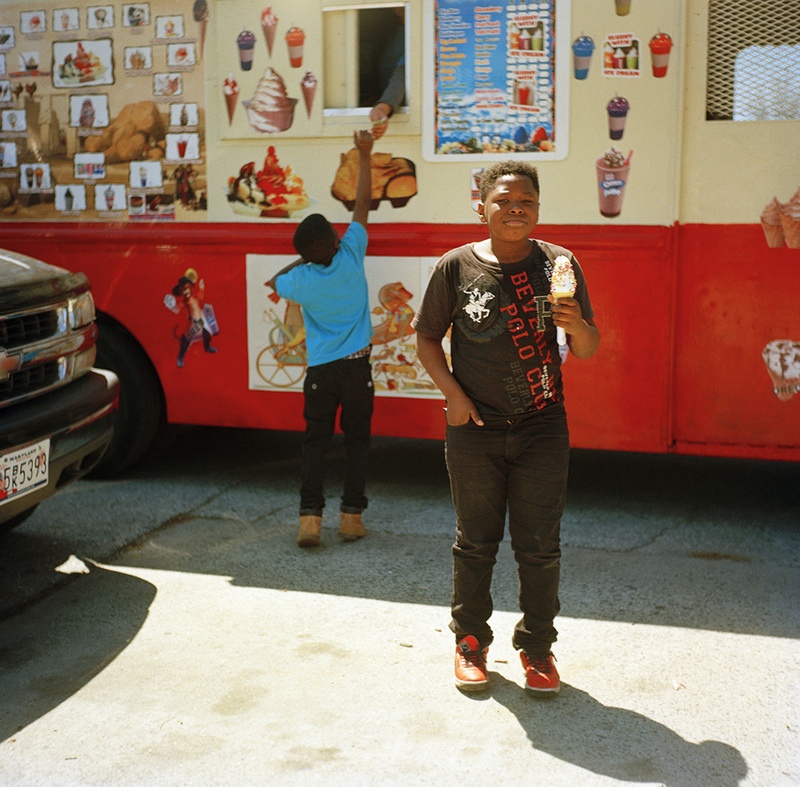 I think Baltimore matures so many kids in ways most kids don’t have to mature, and so much faster- and so much of that maturity is evident in their gaze, gestures, and how they position themselves in front of the camera. How much of what this series became did you have in your head before you began? A few months before I started carrying my camera around the city, I had just discovered Gordon Parks’ A Segregation Story, and that really became my framework for making the pictures. Parks was capturing the Jim Crow-era South in this vivid, colorful way, that brought dignity and life to the people that he photographed, and that sensibility about his work was always in the back of my mind even before I really began photographing. Was it intentional for there to be no adults? I didn’t find it strange initially that there were no adults, since I’d run into kids chasing down ice cream trucks, smoking with their friends, or walking home from school- just things kids do in their free time. But a lot of people have asked me this question! Nearly all of the kids that I photographed were on their own when I came across them. If their guardian or parent was with them, I’d ask them permission first to photograph their child. Were there certain types of kids you were looking to photograph? I just photographed kids that I ran into around my neighborhood, and that stood out to me. 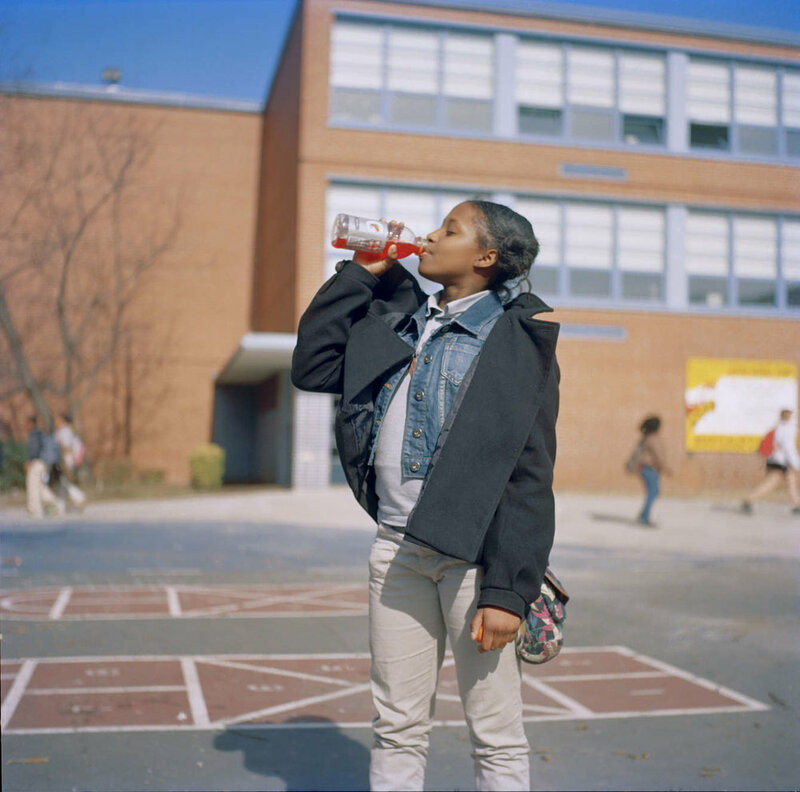 At the time, I was mentoring kids in Baltimore City at Calverton Middle School (none of the kids I mentored are featured in this series), so maybe inherently I was thinking about them, and had an eye for folks their age. What was your process like, in terms of setting up the shots? It really depended on how much time I had with each kid. Some were clearly trying to cross the street or get on with their day, but some had patience with me to set up the shot and really take my time. With the image you reference earlier with the girl wearing the leather jacket, I knew I needed to back up, and capture the sense of place (the brick façade and granite steps that characterize Baltimore rowhomes), and her entire frame, because of nuances like her oversized jacket, the hair blowing in the wind, etc... But as a general rule, I wanted very formal portraits, where the kids are in the dead center, and the focus is on their frame. I shoot with a Yashica D, and the ground glass in that camera automatically sort of centers the focus in the middle of the frame, so everything in the background falls of and is ideal for making street portraits. Is this a series you would like to continue in some way? My senior thesis project, Passing, became an extension of this work. I’m 24, but am often mistaken for a teenager, and have been for most of my adult life. I related my own ability to “pass” to the kids I was mentoring at Calverton Middle, and realized that this phenomenon gave the work a deeper sense of meaning and purpose that had been missing in 3 Feet High and Rising. I had never seen my ability to “pass” as a privilege, inherently, but it created a space for me to empathize with and really seek to understand how to relate to my friends and mentees in a deeper way. I knew that as the one with the camera, I possess the power to tell a story in narrative in a way that reflects my perspective or place. It became important for me to relinquish that power behind the camera, and place myself in the frame with the girls. I’m hoping to someday pick this project back up in the near future, and even form relationships with girls in Atlanta to continue the project with. We’ll see! How did you come to name the series 3 Feet High and Rising? The name came directly from De La Soul’s debut record of the same title. At the time I was making the work, I had just re-discovered De La, and other records from the golden age of rap, and the name just kind of stuck. I loved the word rising at the end, because for me the work is an ongoing come of age project, so these kids are constantly evolving, growing, and really figuring out who they are, and the word rising alludes to that.